The Flash Advance Linker & Flash Advance 64M Card although recently released, is probably old news to hobbyist and programmers involved in the GBA emulation scene. If you don't already know, the Linker is a GBA hardware development and back-up kit, which GBA programmers use to test their compiled game codes. The Linker. is not an official Nintendo development kit. Official Nintendo developers use the official kit, but these kits cost around US$7,000, compared to the Linker which cost less than US$150. Do the math, and you'll understand why the Linker is so popular among budding programmers in the emulation scene (and from what I heard, official developers too, since it's so much cheaper and also because there is no requirement that official tools must be used). Now, before I go on, I must say that I am reviewing the Linker not as a programer, since I don't know anything about coding or game development, but as a regular GBA enthusiast, who would like to know what the Linker is all about and what it can do for me. So, without further ado, I shall continue. Let me first state that the Linker and 64M Cards are sold separately. After I describe what the Linker is, you'll understand why. 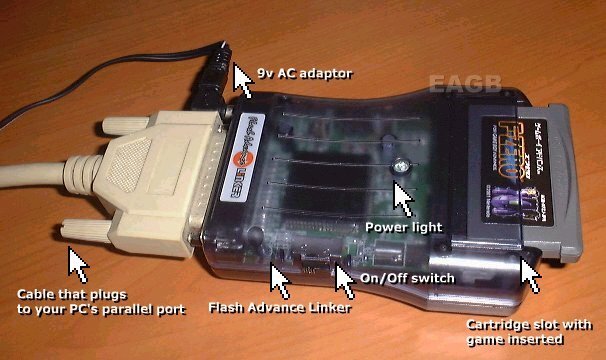 By itself, the Linker is basically a device which backs-up your GBA games and save game files to the hard disk of your computer - and from there to other storage mediums like a floppy disk or CDR for safe keeping. A cable is used to connect the Linker to your computer. This cable is a regular 25-pin parallel/printer extension cable which connects to your computer's printer port. To do a backup, you simply insert the GBA cartridge you want to backup into the Linker's cartridge slot (see picture below) and turn the unit on. The Linker runs on 6 AAA batteries, but you can also use a 9v AC adaptor if you have one. Next, you run the supplied "Advance Writer" software, which works on all flavors of Windows, and click either the "Backup Game" button to backup your game to your hard disk as a ROM file, or the "Backup Saver" button to backup just your game save files (see picture below, but ignore the error because I stopped the process halfway to grab a screen shot). Once you have backed-up your GBA cartridge as a ROM file, you can then use a PC GBA emulator to play it on your computer. More importantly, however, are your backed-up save game data, which the Linker can restore to your cartridge. This is a life-saver if you ever loose or accidentally over-write the original data. 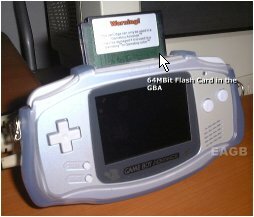 So, if you just want a device to backup your GBA games and save data to your computer, then the Flash Advance Linker is all you need. You don't need the 64M Card at all, and that is why the Linker and 64M cards are sold separately. The Flash Advance 64M Card is basically a 64MBit rewriteable memory card. Just plug it into the Linker, send it a GBA ROM file from your computer's hard disk, and in minutes, you'll have a cartridge that plays just like an original GBA cartridge. As you can see, the 64M Card together with the Linker makes for a cheap and powerful GBA development tool. If you aren't a coder, however, you'll still find a myriad of uses for the rewriteable card. First off, you can use the 64M Card to store and play the many homebrew GBA games developed by hobbyist coders in the emulation community. 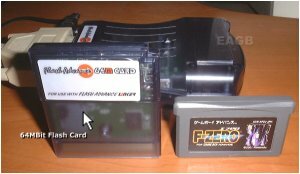 Or, you can use it to make your own multi-game GBA cartridge from all the single original cartridges that you own. The 64M Card acts and behaves like a regular GBA cartridge (except for its size), and because it has its own battery back-up SRAM, you can also save your games. Also, if you happen to find a "patch" for a ROM file you own, you can apply the "patch" to your ROM, upload it to your 64M Card and enjoy the new game features that the "patch" has provided, like extra lives, more ammo or hidden levels. Like any tool, the Flash Advance Linker can be used either for good or nefarious purposes. For those involved in developing games for the GBA, the Linker is a tool for good, because it allows the hobbyist or budding programmer to test or demo their games on an actual GBA, without having to pay the exorbitant amount for an official development kit. As you know, more programmers and coders equals to more innovative and better games. On the dark side, however, is the fact that the Linker is also a tool for unscrupulous people to illegally dump, distribute or play commercial GBA ROMs without ever buying a single cartridge. This is Nintendo's worst nightmare, and the bane of the video game industry in general. I'm not here to pass judgement on the Linker. My review is purely informational, and written from the perspective of a GameBoy enthusiast and gadget lover. As such, I really like the Linker because of all the neat things I can do with it. The things I like most about the Linker is that it allows me to make my own multi-game cartridges, and not have to lug around so many single cartridges for those long road trips (the 64MBit card can store up to two 32MBit GBA games, but a 128MBit card will soon be released that will allows you to store up to four games). The save game backup is also another feature I love, as well as the ability to try out the many GBA homebrew games available on the internet. Of course, the Linker is expensive and absolutely useless without a computer. For many of you, the Linker isn't something you should rush out and buy. If you don't know your "com port" from your "parallel port" or are unwilling to make changes to your "computer bios", then you should forget the Linker since it requires some computer knowledge to set-up properly. For budding coders and gadget lovers, however, the Linker and 64M Card is a powerful development tool and a real cool toy. Be warned that Nintendo could pull this baby off the shelves at any moment, and you'd be well advised to get one today! Believe me, you won't regret it.